Hello guys, it's been a long time since my last submit. 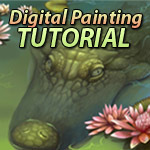 I didn't record the lesson since nothing fancy here, you can find a lot of better tutorial on the internet, but feel free if you have any question and I will try to answer with my best. I realize I must stop to keep silence on everything, so here I am, one of the place I should be back for a long time ago. Sorry to mention this political issue here, also sorry for my long disappearance, really miss and happy to see you guys again. I hope your situation in Taiwan improved since then! Very nicely done! Which default brushes do you use and any special settings? Your blending work is amazing. I hope the situation improves, government should aim to be as small as possible. Nice! Very curious about how you did the coloring and what layer styles you used, or did you just set the grayscale layer on multiply and added color underneath? There is a lot of way to color in Photoshop, multiply / color / soft light / overlay / levels / Gradient Map and they are all great, but I only use then when I turn black/white into color picture (step 4~5), or in the end step when I want to enhance something a little bit more, beside that I just try to find the color I need and paint with brushes without layer effect. This is gorgeous could you explain how you create your line art a little bit? I have a hard time going from thick lines to thinner lines. Amazing! Love how clean it looks! I've heard about Taiwan's political situation right now, I hope nothing too serious is going to happen, nothing like Venezuela or the like, I think the people have the right to speak and act freely and the government should listen to its people. What's the red stuff in the last image? Also wondering what this is. It's a test I'm still working on, it's suppose to be the red color glowing under our skin, to make the picture more soft and colorful, but I'm not skilled with it yet, so it might looked somehow odd.